Why is it Dopey? Because it is funny and you do not need to calculate in order to predict what your next bet will look like. 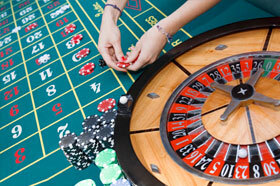 It is a wonderful roulette betting system, as it tells you to relax and have fun. So, one guy Andres Martinez wrote a book "24/7: Living It Up and Doubling Down in the New Las Vegas." You do not need to rush to the store right now. You can simply read further. In his book he describes a very interesting roulette betting system which we describe for you below. You take the money you are ready to spend on gambling today. Divide it by 35, so that you will have 35 equal units (No, you cannot have $5,05 because they don't that kind of chips). Then goes the most important thing - you choose the number you are going to bet on. Yes, you read it correctly. You pick up the number, because we are playing tough today. Andres selected his wife's birthday, which was 22. You number may be any of the line 1-36. And you start betting. You bet on the same number in 35 consecutive spins. There is very high probability that the ball will hit the need number. We can also pretend that we do not know about August 18, 1913. But we also know that roulette game cannot be predicted, unless there is a ball control or somebody is tampering the wheel and our chosen number is not in the cheaters' favor. So, let's assume that you won. Good job! You can continue playing, as it is very pleasant to spend somebody else's money, in our case it is the casino's cash. If you lose, you go home. Why? Because for the last hour you had so much fun and excitement that you do not want to spoil the aftertaste. As you might have noticed, we did not bring examples of difficult or not so difficult calculations as in Labouchere system. You simply take pleasure in the activity. If you want to apply Dopey strategy, you might want to take your friends with you as it may be very fun to compete whose number is the luckiest one.